It also helps to have the Democratic Party in disarray. Following the election of Tom Perez to chair the DNC in February, the party has failed to gain traction. It lacks viable, attractive, and young candidates. Former President Obama has all but disappeared from DNC fundraisers, and Hillary Clinton is so toxic that she isn’t being invited to some of them. The party’s vision/mission fails to generate enthusiasm; it consists of doing everything possible to stall, delay, or derail Trump’s agenda. It’s a totally defensive strategy without a positive message. Perez’s message isn’t lighting any fires. His party had their weakest fundraising month in July since 2007, raising just $4 million compared to the Republicans, who raised $10 million. And since Perez took over the party, it has posted three of its 14 lowest fundraising months since the election of Obama in 2008. Perez’s Democratic Party has other challenges as well, including Maxine Waters and Frederica Wilson, who have not only captured headlines for their antics but apparently appear to many to represent the “new normal” of the party. The Democrat Party Circus… send in the clowns. After Ringling Brothers closed up shop the clown bus has found a new home. I could say the DNC looks like the bar scene from Star Wars but that would be an insult to the characters in that movie. Maxine, Frederica and the rest of that Democrat freak show are gonna make it easy for the GOP in 2018 and 2020. Who can take these empty barrels seriously? The 10 Democrat senators up for re-election in red states are distancing themselves from these left wing nut cases. 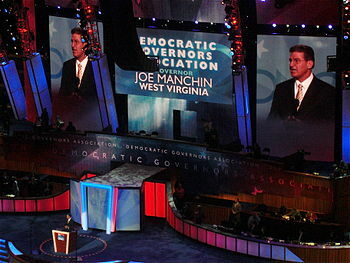 Hillary is not allowed in WV for the next year, so says Senator Joe Manchin. The DNC is toast. This entry was posted	on Wednesday, October 25th, 2017 at 5:44 am	and is filed under Politics. You can follow any responses to this entry through the RSS 2.0 feed. You can leave a response, or trackback from your own site.